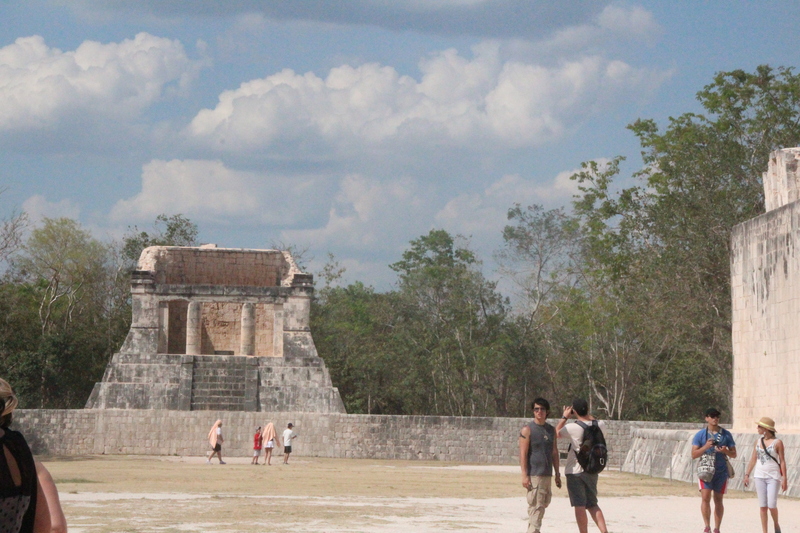 Chichen Itza is outside the city and is around 2.5 hours from the Cancun. This is one of the must see attractions if you visit Cancun and interested to learn & know about the Mayan culture & civilization. This is one of the longest tours approximately 12 hours that includes two & half hours travel time each way. If you are travelling with kids, be prepared to carry snacks, lots of water & some activities to keep them busy. Chichen Itza is one of the most visited archaeological sites in Mexico especially for the aesthetics in their architecture styles and the cultural value that Mayans have brought to this country. On our way to Chichen Itza, we had a stop in Valladolid which is one of the third largest city in Yucatan peninsula. The city reminded me of Pondicherry especially the parallel streets. There is a park in the middle of the city which is in very close resemblance to the Park opposite Pondicherry beach. 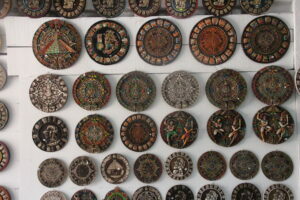 We stopped in one of the local handicraft shops and one of the catching sight was name carving in Mayan language. They also had the option to write an event that will be depicted in Mayan calendar. Arvind wanted to write his name in Mayan that was a three letter name in Maya language. We were just 10 minutes away from the archaeological site and had a lunch buffet in one of the local restaurants. They have options for both vegetarians & meat options that included salads, pasta and dessert. The local people performed Mexican dance while we were eating and it was very nice to see them do tap dancing, have bottles & cups on their heads trying out different postures. It was a delight to watch them dance. 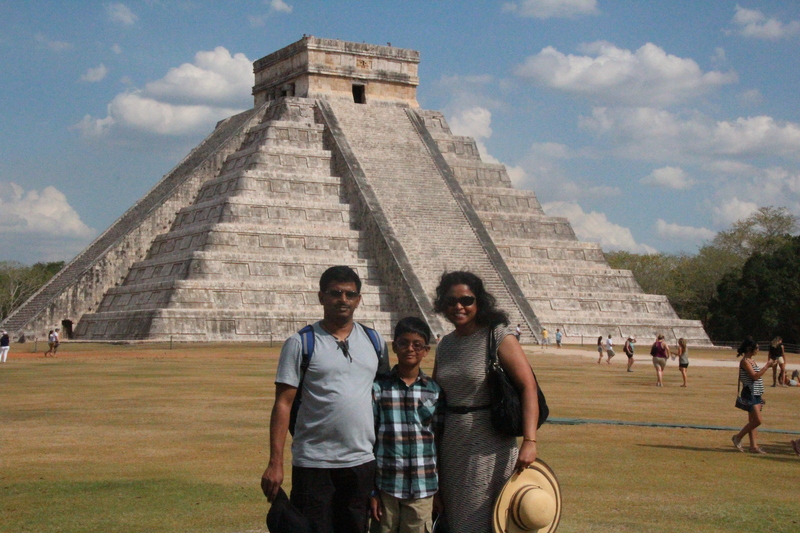 When we reached Chichen Itza, the temperature was so soaring hot that you can feel the heat everywhere. Please do not forget your sunscreens, hats, sunglasses when visiting this place. You will be spending almost 2.5 hours at the site that you will need to keep yourself hydrated frequently. We had bilingual guides available at the site. Our English speaking guide Mr. Santiago was a very knowledgeable person and we had a great time with him throughout the tour. 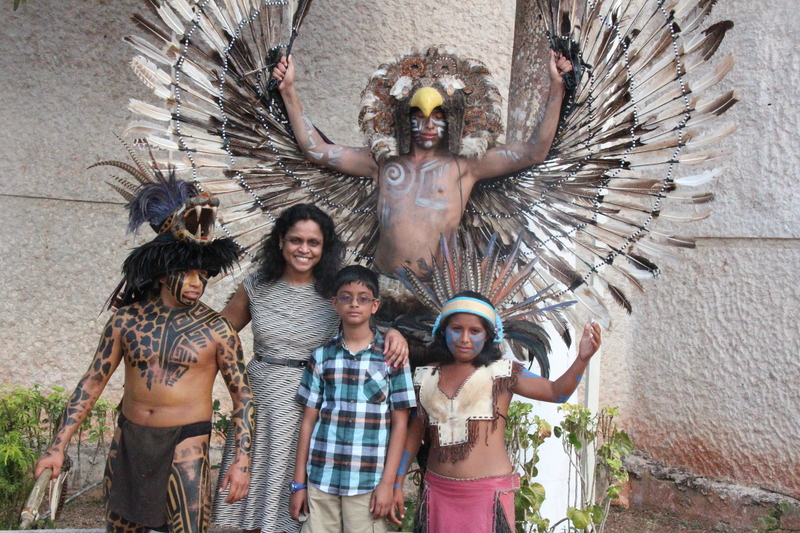 He kept everyone engaged explaining the Mayan history and the architectural information to the finest details. The science & mathematics behind this architecture that the Mayans had especially during 900 AD was amazing. The are The guide also talked about end of the world in 2012 that was wrongly communicated to the entire world. The Mayans have indicated that 2012 was end of the era and another era is born from 2013 onwards which is nothing but starts from zero onwards. There are 4 facades of the pyramid (North, South, East & West). Some of the best known of these complexes are the Great North Platform, which includes the monuments of El Castillo, Temple of Warriors and the Great Ball Court. Our tour guide walked us through each of these places sharing some of the great stories. The north side of the pyramid is known as the Temple of Kukulkan (feathered serpent) and is one of the most predominant platform. 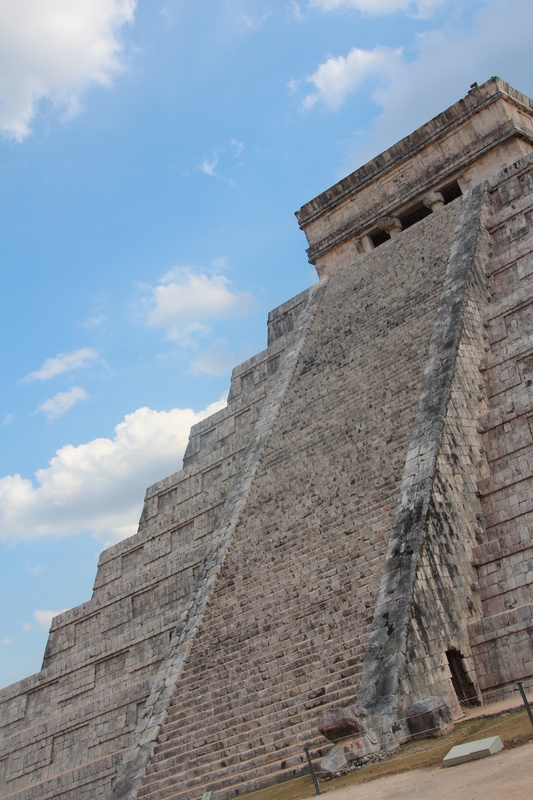 There are many symbolic secrets hidden in the ruins of Chichen Itza. You will see a shadow of the snake on the north side of the pyramid. The snake moves up or down the stairs during each Equinox (Spring or Autumn) This is a representation of feathered serpent god Kukulkan and this is one fact about the Mayans that is not very well known but irrespective it’s an excellent depiction of Mayan culture. This is another interesting area to visit inside Chichen Itza. The Ball Court is 130 meters long and as I had mentioned above the sound designs of Mayans, the kings can pretty much hear between the 130 meter long courts. The echo is so loud so you can imagine the communication those days. There are 12 teams that compete for this game with 7 players each. This is called pok ta pok game where the ball is so heavy that you cannot use your forehead or hands. They essentially used their thighs to lift the balls and pass it to their captains. Back in 2004, it looks like visitors were allowed to climb the pyramid and visit the interiors. The Mexican government stopped this entry after people started to scrape some of the murals from the pyramid and misused the pyramid interiors. 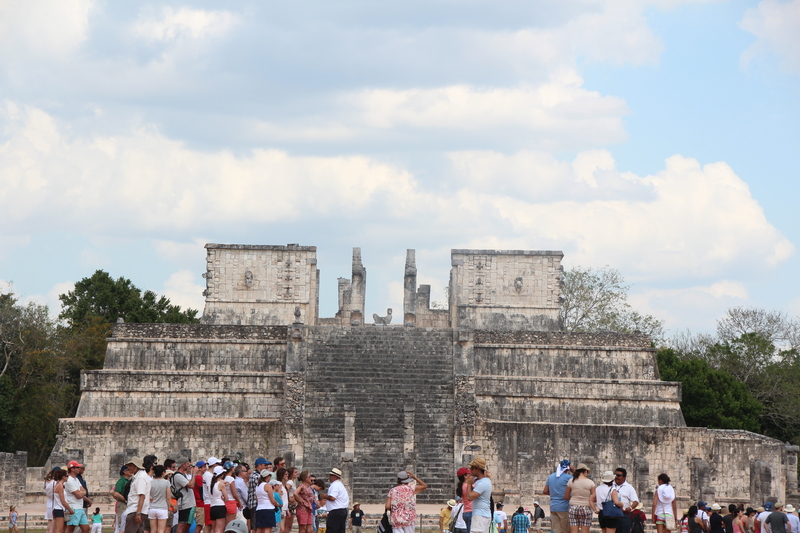 There are plenty of souvenir shops inside the site that also makes it very difficult for visitors to have some quiet time inside Chichen Itza and enjoy the beauty of the architecture quietly. 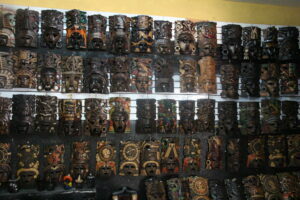 It is increasing becoming more commercial and brings in more distraction to the visitors. Infact the tour guide requested us to write to Mexican government asking them to remove these shops form the site. It makes sense but don’t know how much this can be influenced by visitors. On our way back from Chichen Itza, we visited the Sinkhole where you can dive into the refreshing beauty of the crystal clear sinkhole. This is located just blocks from the heart of the Valladolid city. 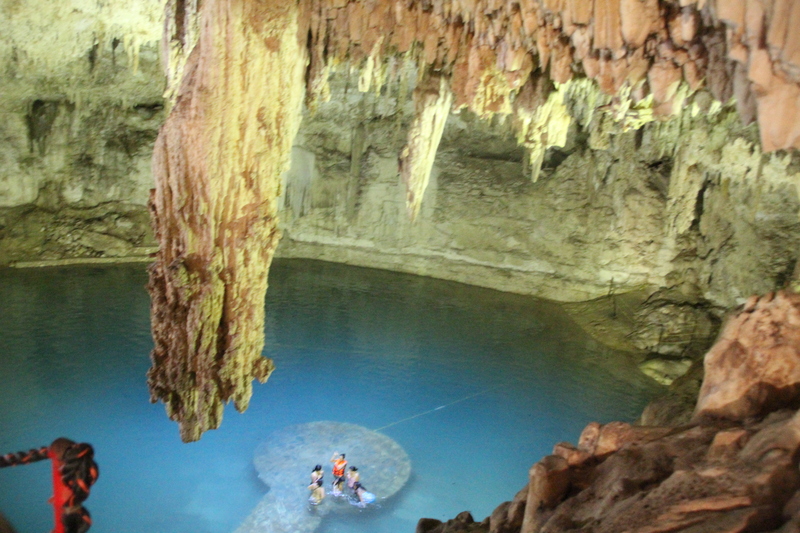 The Cenote is a landscaped freshwater sinkhole where you can access the cave by walking 90 feet down the cave. We did not swim in the water but watched the beauty of this cave and touched the waters. This is supposedly one of the sacred place for the ancient Mayans where sacrifices were conducted by them and it is believed that they were sacrificed with ornaments like gold, Jade and archaeologists have found several remains of the skeleton with these precious stones on them. 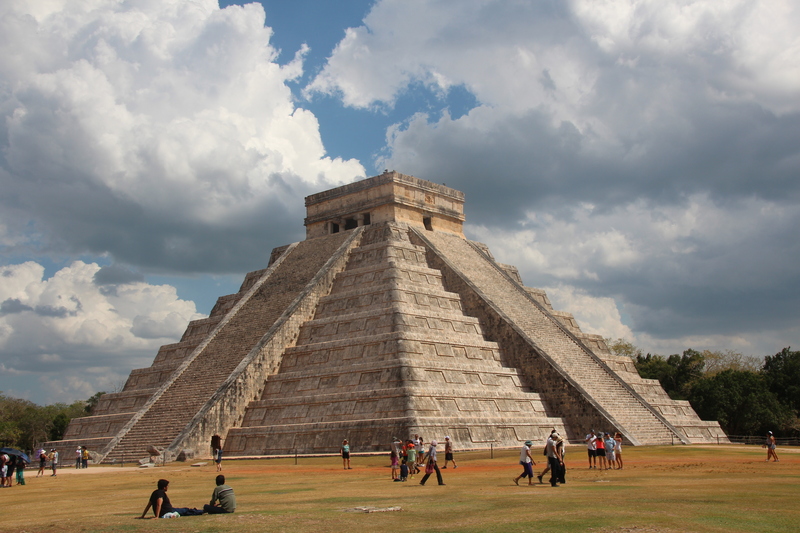 2 Responses to "Seven Wonders of the World – Chichen Itza !" Lovely pictures .. Esp the sinkhole ..The water looks so clean .. ! Great Post .. Thanks for sharing.. Cheers! Thank you Arun !. Glad you liked it.